I have been thinking about barriers to diversity at conferences a lot recently. This is sparked by a few things, including my own recent conference submissions, an experiment that I carried out recently that let people encourage their friends to speak and conversations on the topic. Here is the round up of some of that thinking and things for conferences to consider to reduce those barriers. My thinking has stemmed from gender diversity at tech and agile conferences. As I am a women who goes to and speaks at these types of conferences, it is what I can easily relate to. But diversity isn’t just restricted to gender, it’s about having a broad range of people, experience and opinions represented, this means better conferences for everyone. As a very quick and dirty thought experiment, I took eight (Europe based) tech and agile conferences and counted what appears to be the gender diversity of speakers at them. This is quick and dirty because it’s my assumptions from websites that currently have schedules up, not from finding out what gender those speakers identify as and it’s a small sample size. The stats aren’t surprising, it ranges from 7.5% to 50% female speakers (the 50% one being my own conference) and average at around 25%. One interesting factor that seems to skew the stats is sponsor slots, many of which appear to be filled with male speakers. This graph is just one view on diversity and as I mentioned, this post isn’t just about gender. Based on my current thinking and own experience from attending and running events, here is an initial list of barriers that I believe that organisers should be addressing to create more diversity (it’s repeated in the mindmap above). It is a long list and full of questions rather than answers. I’m sure that I’ve missed some things, so I will update over time. It’s very important to consider both those speaking and those attending as they directly affect each other, so I have included both in the list. I’d be really interested in hearing from organisers and conference participants about their experience in the comments below. You can’t have a diverse event if you are not reaching a diverse range of people in the first place. Widening the pool of high-quality submissions will help create a diverse programme. If the event is open submission, are you reaching a diverse range of people to tell them about the event? Are you making additional effort to reach outside of your network to find new speakers? Are you building a list of routes to find new people? Do you have mentor programmes for new speakers or are you connected to people that do? Do you encourage conference sponsors to consider diversity for speaking slots? Having a more diverse audience will encourage diversity. Are you reaching a diverse range of potential audience members? Are you making additional effort to reach outside of your network to find new audience members? Is the submission process geared towards a diverse range of people? Is your submission criteria inclusive? Are you reviewing your submission process with real users? Do you offer support / mentoring through the submission process? Is your submission panel diverse and is the review criteria appropriate? Are you anonymising submissions for review? If you are is that helping? Is diversity part of your event principles / vision? It can be expensive to go to and speak at an event. Getting a free ticket is a nice incentive, but not covering costs can make it impossible for some people to speak at events. Organisations may not cover travel and accommodation costs, freelancers have to also factor in the cost of not working on days they are at the conference. Are you offering costs to cover expenses for the whole conference? Are you offering any additional payment or offers? Is your price affecting people’s ability to come? Are you offering discounts or incentives to encourage diversity? Does the potential speaker feel confident in their content? Do they know that they have an interesting story to tell? A lot of people don’t think what they know is interesting to other people, so they don’t speak at conferences. Are they confident in the way they are telling the story? Are they confident in putting together a slide deck? Do they have opportunities to practice and get feedback on content if they need it? Do you offer mentoring for speakers? Does the potential speaker feel confident being on stage in front of lots of people? Do they feel physically confident on stage, do they know how to stand, where to put their hands or how to project their voice? Are they able to understand and deal with the physical reactions of being on stage? Do they understand what they can do to help them relax? Are they confident with the audience? Do they know where to look, do they have an idea of how to read an audience? Are they ok with being filmed or having their voice amplified? Looking out and seeing a crowd of people when none of them look like you is daunting. Do they recognise themselves in the audience? Are they comfortable answering questions from the audience? Do they feel confident networking with other people in the audience? Do they feel comfortable asking questions of speakers? Do they relate to speakers in previous years? Not feel like a “token” person. Do they relate to the other speakers on the programme? Do they relate to the people on stage? Could they see themselves there one day? Are you making it clear what the benefits are for speaking at an event? Are you making it clear what the benefits are for attending an event? 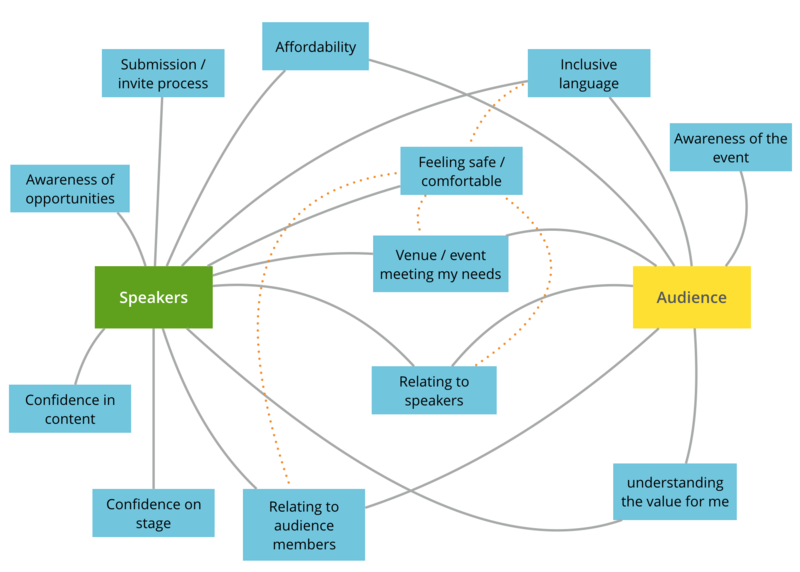 Are speaker, presenters at the event using inclusive language? Are you making this part of the terms and conditions of participating? Is the marketing material using inclusive language? Diverse audiences may have needs that you haven’t considered and aren’t catering for. Does the venue meet the needs of your speakers and participants? Have you done any research to find out what these are? Is your catering inclusive for dietary requirements? Do you have a code of conduct and are you prepared to act on it? Are your event staff focused on creating a safe environment? Are you welcoming people and making it easy for them to ask questions? Can your participants relate to your venue staff? Next The Agile Team Onion. How many pizzas does it really take to feed your team? Nice post Emily. Lots of thought-provoking material in there … and a lovely graphic as always. I love what you’ve done here. For me I’m mostly new to organising conferences. 2015 was the first one I’ve done, and more or less single handed. I learned a lot, however, reading your article makes me realise there is a huge amount more I could be doing to meet the needs of the various personas involved. Our gender diversity stats are pretty decent I think, but I’ll be honest that’s as much happy accident than it is by design. For 2016, 25% of all talks submitted through our open submission process were from women. Of all the talks accepted 35% were women. So we’re pretty happy we’ve got that far. Our approval process is blind, we remove all the names from the submissions and talks are accepted based on how interesting and engaging we feel they are. So we got lucky. One lesson from last year from me was a delegate who gave us feedback on the lack of Gluten Free options in our food. My initial response was quite dismissive, then in December I was diagnosed with Coeliacs and have a strict gluten free diet. I failed completely to understand that individuals need, until I had to experience it for myself. This year we will be making more effort to accommodate dietary concerns, and have set up our bookings to ask this question. I’ll be taking more of your comments away with me as food for thought and applying them for 2017 for sure. thanks for your response and your honesty. I find it really interesting that 70% of your female applicants got through. Which completely blows the argument about needing to “lower standards for better diversity” out of the water. I’d be really interested to know what your audience stats are like conferences are the whole package, not just who speaks. It’d also be good to chat at some point during Agile Cymru (where I’m one of the 70%). Something else I’ve just realised, both our Day 1 keynotes for last year and this year are women. I’ll have a look at last years attendance, I don’t think we’ll have stats as good our speaker ones. Maybe that’s indicative of the dominance in the industry? Emily, we’ve spoken about this a fair bit beforehand and since so thank again for doing this. The point about sponsors not considering diversity when offering speakers to events is a new one for me. I’ve advised my team to ask our sponsors to consider that when suggesting speakers. As you know, as well as gender diversity I’m also interested in other forms of diversity. Would be great to some some work in that area. (Not just from us!). Have shared whole blog post with the team and also planned a follow-up session specifically on diversity with them. Fantastic questions for all; particularly for education conferences. More and more people choose not to travel to attend events or are not able to travel for various reasons. Creating conditions for remote participation – not only video streaming but some kind of interactive participation in plenary and break-out sessisons – is actually quite doable these days. This is about making events more inclusive and even more diverse. Of course, that’s not only up to event organisers. Participants and speakers also need to make some effort to include remote participants. I suggest something about remote participation needs to be added here.